He did it to Go , he did it to chess and now he is doing it in ‘StarCraft II’ . The artificial intelligence system AlphaStar developed by DeepMind played in December a tournament against two professional players of this video game and won almost all games. He did it in somewhat special conditions, but still managed to crush them by 5 games to 0 and there was only one occasion in which one of those players managed to overcome a new version of AlphaStar that was still in development. Things are looking bad for the professionals of ‘StarCraf II’, a game that posed an important challenge to the engineers of DeepMind and that once again has been overcome with the so-called convolution neural network. The difficulty of this video game was that the machine does not have all the information before making the move since in Starcraft II the map is unveiled as the units move forward. Intuition and trying to guess what the opponent is doing is very important, but even so the DeepMind AI has managed to offer an exceptional level. This video summary offers only a few repetitions of the tournament that was held in December and that confronted AlphaStar with two professional human players, Grzegorz “MaNa” Komincz and Dario “TLO” Wünsch, from Team Liquid. The human players had confidence in managing to overcome the machine , but they found five consecutive defeats. The conditions for the meeting were something special for human professionals. TLO normally plays with the Zerg race, but had to play with Protoss, the only one of the three races with which AlphaGo currently trains. He lost the five games and it was the turn of his partner, MaNa, who did play with Protoss and therefore seemed more prepared to compete on equal terms. It did not help, because AlphaStar also defeated him by five games to zero. In these games AlphaStar demonstrated exceptional management of their units, removing them when they were damaged and replacing them with stronger units at the front of each battle. Minimized own damages and maximized the damage of the rivals, something that went beyond the relevance of the actions per minute (APM) that can be achieved in this game, and that in fact surprisingly were superior in the case of humans . The AlphaStar elections, simply, were better . Human players faced a single artificial intelligence system, but in reality AlphaStar made use of five different agents that had been trained with different targets, which reveals that even that variation of the specific AI engine was superior with those variations. 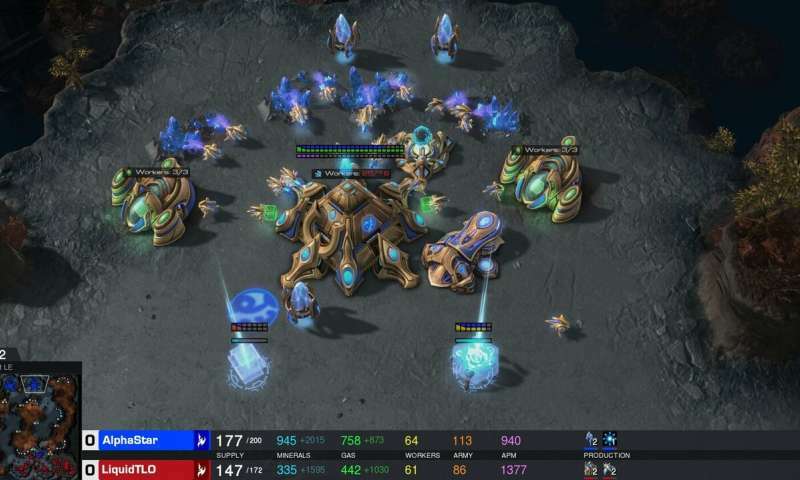 To train them the systems previously played the so-called “AlphaStar League”, a competition in which agents played again and again for a week and “absorbed” the equivalent of 200 years of games of StarCraft II between humans . For Komincz the result was surprising: “I was impressed to see how AlphaStar made advanced moves and different strategies in all the games, using a very human way of playing that I did not expect, I realized how my way of playing depends on forcing the opponent to make mistakes and be able to take advantage of human reactions, so this has given a new perspective to the game for me.